A Message From The Other Side begins with a mysterious phone call which takes Catherine Sinclair aback. The voice on the other end of the phone appears to be Gil Sinclair, her estranged husband Kenneth’s brother. Gil has been missing for years and his possible return makes Catherine, Kenneth and Catherine’s sister Helen very uneasy. Why do they all have reasons to be concerned that Gil may have returned and what does one of them in particular have to fear? From this very intriguing prologue, the story spools back several years and follows Catherine and Helen over time, looking at their relationships with the various men in their lives and with each other. It did take me a wee while to sort out who was who and how they were connected but, once I had, I found this a very compelling read. I was particularly interested in the relationship between the sisters. They live very far apart – Catherine in the Highlands and Helen in London – and I felt that their relationship was often also emotionally quite distant. Neither really understood the other’s romantic attachments and were quite judgemental I felt. Yet it was clear that they did love each other even if they didn’t always understand each other. The complexities of romantic relationships were also considered throughout the book. Both sisters were married for a second time and the challenges of these second relationships were well described, in particular showing how what went before impacted on current relationships. I was not fond of Catherine’s husband Kenneth who seemed very intolerant of her daughter Flora and rather arrogant and self-assured in general. By contrast, her friend Hugh was lovely and I enjoyed reading about his compassion and quiet wisdom throughout the book. Throughout the book there is always an element of suspense harking back to that mysterious phone call in the prologue. The author gradually begins to hint at what might have happened as she explores the connections between the sisters, their husbands and their friends. The answer, though not unexpected, clearly had an impact on them all throughout the years. 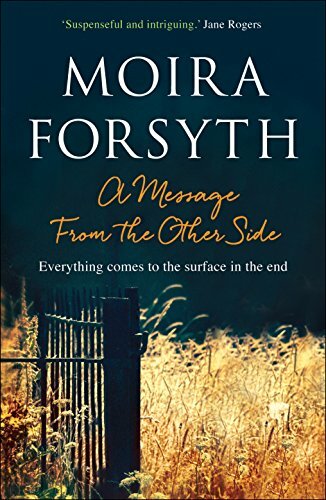 A Message From The Other Side is an intelligently written work of literary fiction which kept me engaged throughout. My thanks to Diana Morgan at Ruth Killick Publicity for my copy of the book. It was published on 20th July by Sandstone Press in both paperback and e-book form. It is available from all good bookshops or you can order a copy online here where it is currently on offer for only £1 for Kindle A Message From The Other Side It is also only £1 from the Kobo store and iBooks. When Catherine moves several hundred miles away from her sister, Helen says, ‘Phone calls aren’t enough’, but they make it easier to edit the truth. Helen can dismiss Gilbert and his enchanted Factory as ‘weird’ when she’s never met him, and Catherine think Helen foolish for loving the unreliable and dangerous Joe. Neither sees the perils concealed in what they have not told each other, or guesses at the sinister connection between their separate lives. A Message from the Other Side is a novel about love and marriage, but even more about hatred and the damage people do to each other in the most ordinary of families. Oh this sounds like a really good read, will definitely keep an eye out for a copy of this!